As the Strange artists gear up for the All 6’s & 7’s Tour, their biggest tour to date, die-hard Strange fans are putting down the extra money to order VIP packages for the tour. The VIP packages come with show admission (of course), a hefty merchandise package, and a backstage meet-and-greet session with the tour artists. This means fans have the opportunity to meet the Strange artists, and sometimes others who have joined the tour, which in the past has included the likes of : E-40, Slaughterhouse, and Glasses Malone. Some fans who may not have participated in the VIP experience for any number of reasons may still know what it’s like to get to meet the Strangers. After their shows, for example, Krizz Kaliko often comes out to greet fans at the merchandise booth, signing autographs and taking pictures. 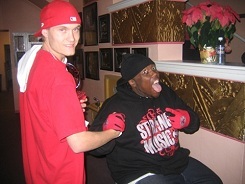 Even at the in-store meet-and-greets, Krizz often shines through as a fan favorite. He warmly greets fans, poses for pictures, signs merchandise, and openly chats with fans. Krizz is known for speaking candidly on his personal life, upcoming projects, and future tours with the fans. The personable attitude of Krizz makes even the most brief meetings with him a memorable experience for many fans. One can only imagine the VIP session for the tour being all that and more. Fresh off the Strange Noize Tour 2011, Kaliko will prepare to hit the road once again, and hit city after city across the nation. This year, Kaliko will be joining Tech N9ne along with Kutt Calhoun, Big Scoob, Jay Rock, Stevie Stone, and ¡Mayday! for the official All 6’s And 7’s Tour. Don’t miss out on your chance to experience the show in style with VIP! Click here to order your very own VIP package for the All 6’s And 7’s Tour.